The UK’s leading veterinary charity, the PDSA, has launched its annual Animal Heroes Writing Competition 2017 to celebrate the 20th anniversary of World Book Day. Hilary has teamed up with the charity to write the beginning, middle and end of a story called ‘Buddy Saves The Day’ – and it’s up to young people to write the rest! The winner will receive a set of signed books including Flo of the Somme, an Amazon Kindle and an opportunity to meet Hilary herself at one of the PDSA Pet Hospitals. To submit your stories, go to the PDSA Writing Competition website. You’ll find Hilary’s prompts and you can also read an article by Flo of the Somme, all about how she and other animals helped in the war effort. War 1. 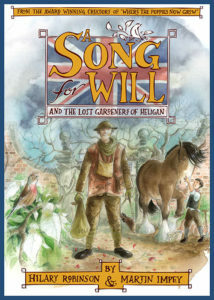 The story, which has drawn on archive and military detail of the time and includes many local landmarks and places of interest at Heligan, has been described as a deeply moving tribute.